Wobblers syndrome in dogs is an issue that mainly affects large and giant breeds. It is a compression or slippage of the discs in the spine that results in neck pain and mobility issues – sometimes even paralysis. Wobblers can also be caused by malformed bones. Medically, this condition is a mouthful – known as cervical spondylomyelothy or CSM. It is more commonly referred to as “wobblers” because of the wobbly walk that results in dogs suffering from the condition. While wobblers syndrome is most common in large and giant breed dogs, it is possible – though rare – for smaller dogs to be affected – like the basset hound. The long, short body structure of the basset hound makes this breed extra susceptible to spinal disc compression and slippage. While the exact cause of this disorder remains unknown, there are two main factors that seem to cause wobblers syndrome in dogs… genetics and nutrition. 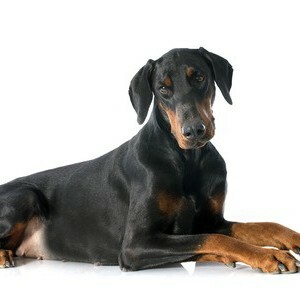 Many vets believe certain bloodlines of Great Danes and Doberman Pinschers contain a ‘wobblers gene’ – perhaps especially because this syndrome is most common in these two breeds. As well, it has been seen that nutrition plays a key role in the proper development and healthy maintenance of all bones and connective tissues. The most obvious symptoms of wobblers is the unsteadiness, or wobbly walk – usually of the back legs. If a dog is in the beginning stages of developing this syndrome, this symptom may only be noticeable while walking slowly or on slippery floors. As this issue progresses, the instability will become noticeable in all four legs. It may also appear that the dog is weak and has difficulty getting up or laying down. Another warning sign of wobblers is walking with the head down. As the spinal cord and surrounding nerves are compressed, the dog may lower his head to compensate for the discomfort. Depending on the severity of an individual case, traditional treatments range from surgery to medical management. It’s important to note that because Wobblers issues affect a dog’s neck, it is necessary to use a chest harness instead of a collar-attached Leash (for ‘dog walk’ needs) to prevent further injury or pain. Diet plays a critical role in slowing the progress of wobblers syndrome. 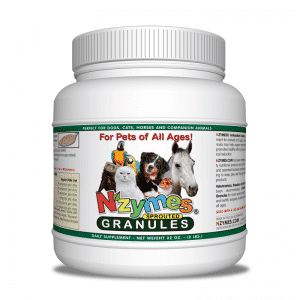 The natural anti-inflammatory properties of NZYMES® Antioxidant Treats or Granules have been found to be extremely beneficial to dogs with wobblers. Please read this story about Zelda Mae as an example, OR see a very short story about ARIES. Changing to a healthier, more holistic diet, along with adding NZYMES® Antioxidant Granules to a daily feeding routine can provide significant improvement for your dog’s chance to live a more normal lifestyle. More detailed information about wobblers and a great suggested feed program can be found by clicking here.